To celebrate the MX-5 Miata breaking the 900,000 sold mark Mazda is releasing a special edition for 2011. The special edition comes in two new colors “Sparkling Black Mica” and “Dolphin Grey Mica” and the interior is clad in black leather with grey stitching. You also get a set of aluminum pedals in the 6 speed version. The special edition comes with the power retractable hard top only but hey who really wants to pick the soft top when you could have the hard top anyway? The optional suspension package for the grand and touring models come standard on the special edition and Mazda also throws in a limited slip diff for flavor. Despite all the nifty one-offs for the special ed. the MSRP is only $30,925 for the manual and $31,525 for the 6-speed auto complete with paddle shifters. However even though the price is low doesn’ t mean this car will be easy to get. We’re only going to see a production run of 750 units total so if you want one you should be reading this last sentence on your smart-phone while walking out of your house to drive out to your local Mazda dealer. Otherwise you’re probably already too late! 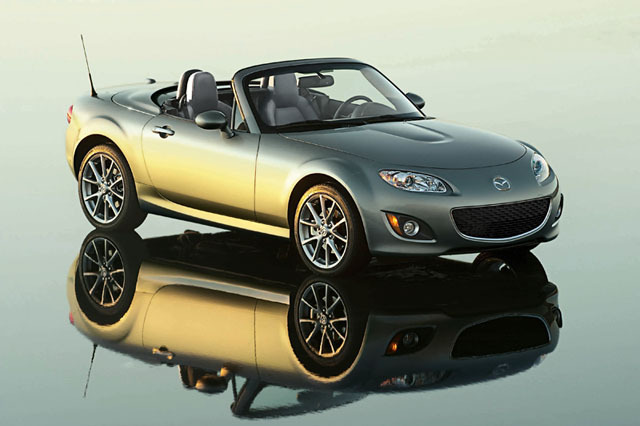 CHICAGO (February 9, 2011) – On the heels of its recent milestone announcement of 900,000 MX-5 Miatas being produced, Mazda North American Operations (MNAO) today unveiled the 2011 MX-5 Miata Special Edition, a limited-run model of only 750 units. The Special Edition continues the MX-5’s history of being a dynamically-engineered, enthusiast-approved roadster whose price doesn’t discriminate and whose luxuries are not stripped. Special Edition-exclusive interior touches include gray door trim and heated leather seats with gray stitching, a black leather-wrapped parking brake and steering wheel with contrasting gray stitching, chrome treatments to the air vents and instrument cluster as well as aluminum pedals (6MT only). Special Edition models are only available in Sparkling Black Mica or Dolphin Gray Mica, two new MX-5 colors, and are packaged with 17-inch Bright Finish aluminum alloy wheels. The MX-5 traditionally has appealed to higher income households as its purchase reason is not as the practical daily driver but as the additional “fun” car, such as for those long, winding road-hunting weekends. Originally available in three trim levels – Sport, Touring and Grand Touring – the Special Edition is based off of a fully-equipped Grand Touring model but is only available with the industry-leading, easy-to-use Power Retractable Hard Top (PRHT). Popular in both warm and winter climates, PRHT models go from rain-deflector to sun-worshipper in 12 seconds – with trunk space to boot – and outsell soft tops 4:1 worldwide. In the United States, there also is no lack of interest for premium accessories as 70 percent of Grand Touring models sold are PRHT-equipped, of which 50 percent are optioned with the Premium Package. The Premium Package is standard on the Special Edition and includes a Bluetooth® hands-free phone system, SIRIUS® Satellite Radio with a six-month complimentary subscription, Xenon headlights, Dynamic Stability Control (DSC) with a Traction Control System (TCS), an anti-theft alarm and the Mazda Advanced Keyless Entry and Start System. It is no secret that on any given weekend more Mazdas and Mazda-powered vehicles are road-raced than any other brand. Performance and tuning are dynamically engineered into every Mazda and the MX-5 Miata Special Edition retains its sports car soul but with a few niceties not meant for the bumper-to-bumper love taps of the track. The Suspension Package, optional on Touring and Grand Touring models, is made standard with the Special Edition and includes Bilstein® shocks, a limited slip differential (LSD) and a sport-tuned suspension. Both the six-speed manual transmission with short-throw shifter and six-speed Sport automatic with steering-wheel-mounted paddle shifters are available to enjoy the 167-horsepower, 140 lb-ft of torque 2.0-liter four-cylinder engine (158 horsepower with the 6AT). At only 2,593 pounds (2,619 pounds for the 6AT), the MX-5’s nearly 50:50 weight distribution, combined with its track-proven suspension and responsive power, mean the rear-wheel drive sports car is a lightweight only in terms of size, not road prowess. The 2011 MX-5 Miata Special Edition starts at $30,925 for the manual transmission, and $31,525 when equipped with the six-speed Sport AT automatic.